Fans are awful, because noise is awful. So when we see a way to cool down a scorching CPU with zero moving parts—that means silence—we're excited. Especially if it's as awesome looking at this one. 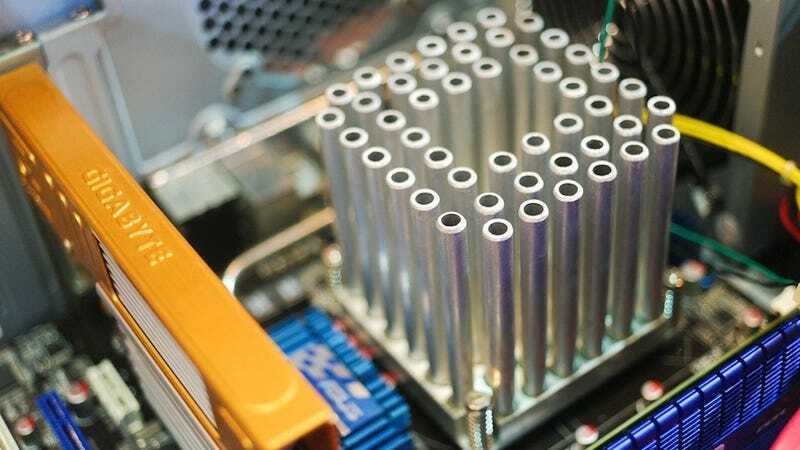 The CompTake "Chimney" uses 48 hollow pipes positioned directly atop the CPU, creating a huge amount of surface area, transferring the heat produced by the CPU directly into the air. This principle of passive cooling is nothing new, but we haven't seen a take this wonderful looking—48 pipes!—in a while. And while it'll probably be locked in your tower, out of sight, any true PC nerd takes pleasure knowing it's inside there, piping hot air.